The Wolf Pac 3100 roller's combination of rear drum ballasting and internal front drum vibration allows the operator to match the machine to the application. Center point articulation, a short wheelbase and high curb and minimum wall clearance on both sides make this roller incredibly effective in confined areas. 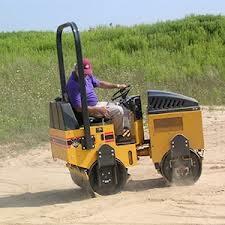 * Questions on our double drum roller 01 stone rentals? Please call us!